Roller shutters not only save you money by protecting your property from crime and vandalism, but there are significant energy savings in our harsh climate. Light: Windows are important to let light in, but when the weather is hot, blocking out or controlling strong sunlight can save you a lot of energy in cooling, Shutters are designed to provide both total block-out or partial shade, depending on how tightly you close them. 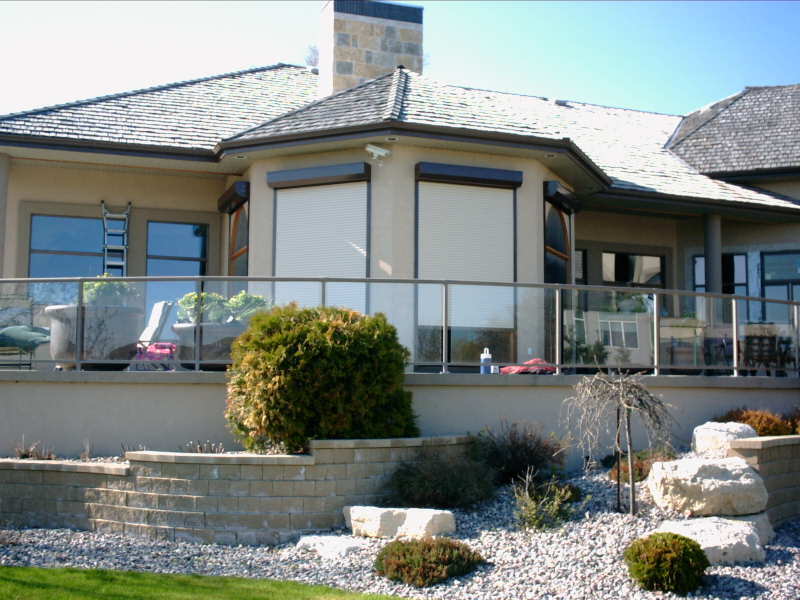 The ease of operation makes roller shutters easy to adjust to block out full sun when you need that protection. Insulation: Roller shutters can provide significant savings on not only cooling, but heating too! Modern shutters provide dead-air barriers within the cells of the shutter and between the shutters and glass surface. The savings from the insulation factor alone can pay for the cost of having shutters installed. Watch your heating and cooling costs reduce immediately. Shutters can be activated after dark, during harsh weather or whenever additional energy savings are desired. Protection: Beyond security are concerns for protection from weather events. Wind, hail, snow and rain storms can damage glass and doors. Roller shutters provide a robust deflective, resilient surface to protect your property. Privacy: Light and noise issues issues can be controlled or eliminated with roller shutters. Enjoy open doors and windows without the issues of excess sun. The interlocking design allows air circulation with partial noise and sun protection light when in the extended position. When fully closed, the room is darkened and quiet. Shift workers appreciate shutters on their homes, creating a comfortable atmosphere for sleep. Capital Value: Your building’s resale value is more likely to increase with the installation of roller shutters. They will also protect other property assets from deterioration. Insurance: You may find that your insurance provider can give you preferred annual rates as your risk factors drop with the installation of roller shutters. Maintenance: The reliability of the high quality materials we supply and our skilled installation leads to reduced maintenance costs. The superior design of our shutters aims at being a largely maintenance-free part of your building. Roller shutters also reduce the regular cleaning and maintenance of the windows and doors they cover. If you consider that all of the elements and hazards they are protected from when the roller shutters are closed, you see how much they can prolong the lifespan of other aspects of your building. Energy-efficiency credits: The energy savings afforded through roller shutters can factor into the efficiency of your building. You may be able to leverage this in the form of points toward government renovation cost rebates. The decision to add security roller shutters to your home or building is often the right one. Give Kiwi Installations and Sale a call for a free consultation and estimate.